1.Read and clear OE-level codes for all the available vehicle systems. That includes engine, ABS, transmission, instrument panel, SRS and more. 2.Provides live data. Besides offering real-time diagnostic feedback, live data also helps when you need to turn off warning lights. 3.Supports actuation tests, adaptation, and matching. For instance, you can use it to program the ECU, tire pressure monitor and keys. 4.Reset oil service, EPB, SRS, ABS, SAS, and TPMS relearn. 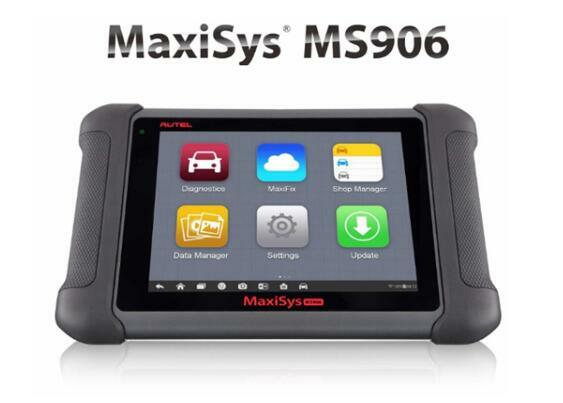 Although the Autel MS906 is primarily an OBD2 scan tool, it also supports full OBD1 diagnostics. But you will need the OBD1 adapter for the vehicle in question. One of the best features of the Autel Scanner Autel MaxiSYS MS906 is its ability to identify a vehicle with one touch. This AutoVIN function detects a vehicle’s VIN number from the ECU then records and stores it. If the AutoVIN feature fails (which is almost never) you can still enter the vehicle’s details manually. At the back of the Autel MaxiSYS MS906 from OBD2TOOL is an 8MP camera that has a flashlight. It is meant to help you take pictures whenever you need to. Since the device is Wi-Fi enabled, you can share the pictures online with technicians and other experts or DIYers. They may help with whatever problem you are facing. Camera makes it easy to capture parts and share them with the online community of technicians. The one thing that is undesirable about this scanner is the amount of time it takes to recharge the battery. It really needs a lot of time, and if you’re in a rush that may be an inconvenience. On the upside, you can use it as it charges. One reason why the Autel MaxiSYS MS906 is a favorite for many technicians and DIYers is because it balances functionality and design almost perfectly.